Earlier today, the City of Phoenix Parks & Recreation Department announced their recommendation for the Hance Park Master Plan RFQ (Request for Qualifications). The four finalist firms were Weddle & Gilmore (from Scottsdale), Stoss Landscape Urbanism (Boston, Mass. ), Gould Evans (Phoenix), and West 8 Urban Design (Rotterdam, Netherlands). The recommendation went to Weddle & Gilmore, having scored the most points on the City’s scoring criteria. 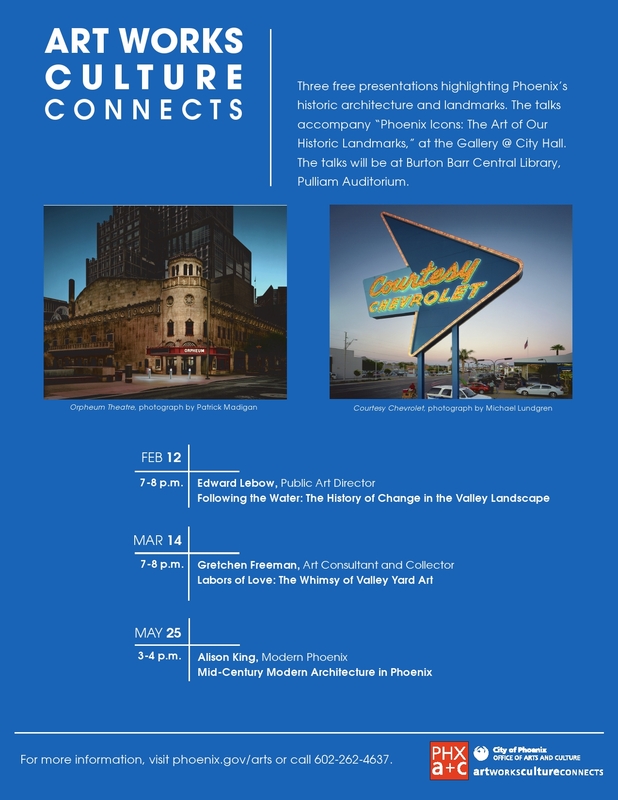 !melk (landscape architecture) – New York, N.Y. Floor Associates (landscape architecture) – Phoenix, Ariz.
HR&A Advisors (development advisory) – New York, N.Y.
ETM Associates (public space design) – Highland Park, N.J.
City Activators Inc. – New York, N.Y.
Pentagram (visual design) – London / New York, N.Y.
Kimber Lanning (Local First Arizona) – Phoenix, Ariz.
Public Workshop (youth involvement in urban design) – Philadelphia, Penn. David Evans & Associates (land development design) – Portland, Ore.
Buro Happold (environmental engineering) – Bath, England, U.K.
IAS Labs (soil analysis) – Tempe, Ariz. Artistic Arborist (tree management) – Phoenix, Ariz.
RAMM (geotechnical engineering) – Tempe, Ariz.
We look forward to working with Weddle & Gilmore as well as these other organizations to make Hance Park a world-class park. Where/When: Burton Barr Central Library, 7-8 pm. 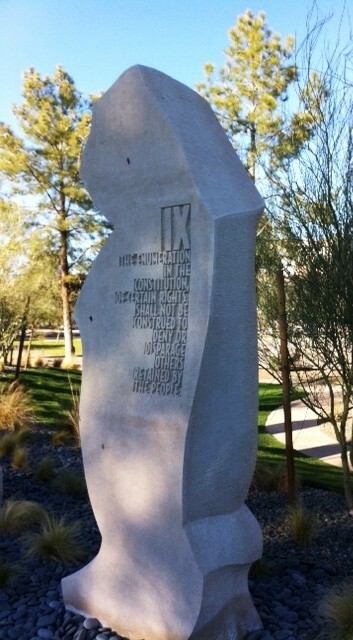 Here’s a great shot by Jim McPherson of one of the 10 monuments to the Bill of Rights, dedicated in December in the Wesley Bolin Plaza in Phoenix. Downtown Voices Coalition is proud to have been an early supporter of this project, the first in the nation. Read more about this accomplishment (and see more photos) here. The City of Phoenix has won its case to keep its parking lot on the same block formerly occupied by the Sahara/Ramada Inn. A court verdict on Monday reaffirmed the city’s decision to build a temporary parking lot adjacent to Taylor Place, rejecting an appeal filed by a downtown Phoenix resident and community activist. The verdict came over two months after the plaintiff, Sean Sweat, a capital supply engineer for Intel, had his appeal heard before Rea in July. Some downtown Phoenix community members had attempted to stop the construction of the parking lot, which opened in June at the site of the former Ramada Inn, by proposing a dog park. Read more at The Downtown Devil. The Irish Cultural Center, located at Hance Park, is expanding its facilities by adding a three-story library. 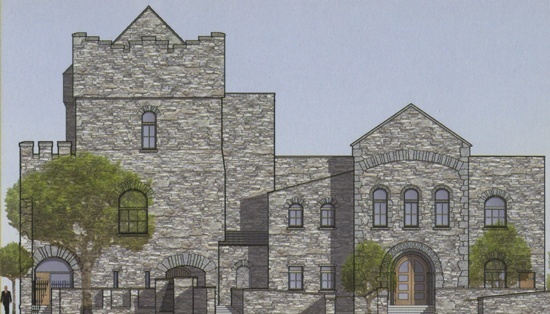 A major addition is in the works at the Irish Cultural Center in downtown Phoenix. A flurry of construction has been taking place over the past few months on a castle-like, $3.5 million research library that will be located in the center. The three-story building, which will be finished in January, will feature 15,000 square feet of space for research purposes and a variety of Irish-oriented classes and workshops. Read more here. With the renovations coming to the remainder of Hance Park, this will be a very pleasant addition to the area. Civic Space Park in downtown Phoenix is one of five finalists for the Rudy Bruner Award for Urban Excellence, a recognition given every other year for urban spaces that contribute to their community. A team of three judges visited Phoenix this past week to evaluate the park and its impact on downtown Phoenix. 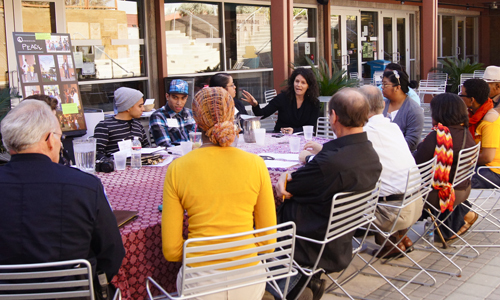 At an interview luncheon Tuesday, members of the community gathered to present their case. Among those speaking were community volunteers, performers who use the park, members of arts groups, a police officer, and some of the men and women who collaborated to create Civic Space. All attending spoke in favor of the park’s versatile spaces, safety record and, most importantly, tolerance of the area’s inhabitants, who include many homeless and mentally ill. The nearby Westward Ho building is a low-income housing center for the elderly and many residents frequent the park. ASU’s liaison to the park, Malissa Geer, explained that diversity makes the park what it is. As a large presence in the downtown area, the university needs to “break the fear” that pervades the perception of the neighborhoods surrounding the Downtown campus, Geer said. Safety is often not the true issue. The homeless are rarely dangerous, but rather, make other citizens — including many students — simply uncomfortable, she said. Cmdr. Richard Wilson, the police officer who spoke at the interview, said that many students and parents question the safety of the park, but in reality there is little danger. Geer said it’s important to activate the park — to raise the number of people using the park on a daily basis. The park is one of just a few in Phoenix with a security presence, and not only can the park be a beautiful place to visit, but a necessary encounter with urban living, Geer said. The award for urban excellence measures, among other things, the impact on the community. One way that impact is shown is through inclusion of all facets of the population. Already the park has garnered a $10,000 prize for being a silver finalist, and if selected for the gold it will receive a total of $50,000. Other finalists include The Bridge Homeless Assistance Center in Dallas, Brooklyn Bridge Park in Brooklyn, the Gary Comer Youth Center in Chicago and the Santa Fe Railyard Redevelopment. Civic Space is the only project this year that is technically a city park. The 2009 winner was Inner-City Arts of Los Angeles, an organization that services youth in the city’s Skid Row area by providing art instruction and education. Phoenix’s Encanto Park, recently named by Forbes Magazine as one of the nation’s 12 best city parks, will be celebrating its 75th anniversary from 10 a.m. to 8 p.m. on Nov. 27. The daylong celebration will feature live music, kids’ activities, food and a spectacular fireworks display at 7 p.m.
Encanto Park lovers also can support it at a fundraising reception at the park’s Clubhouse sponsored by Friends of Encanto Park. The reception features food from local restaurants and live music and performances. Ticket prices for the reception are $50 in advance or $75 at the door. Comprehensive event information is available online at phoenix.gov/parks. 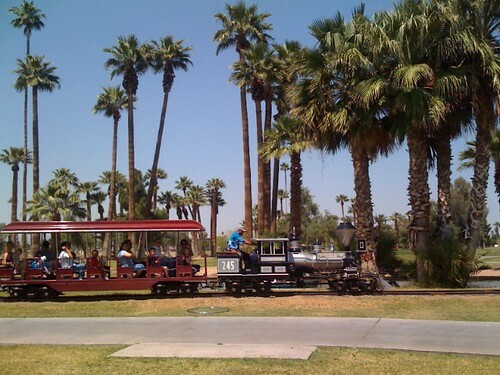 Encanto Park’s 65 acres, located in the heart of central Phoenix, boasts dozens of massive trees of numerous species. The 27 holes of the adjacent Encanto Golf Course, along with the park, offers residents more than 200 total acres of green space right in Phoenix’s urban core. Its fishing lagoons attract thousands of anglers each year. Visitors can rent paddle boats to set out on the park’s waterways. The park also features a sports complex with lighted basketball, handball, volleyball, tennis and racquetball courts; lighted picnic areas and grills; an exercise course; a playground; a pool; a recreation building; and restrooms. It is also is home to Enchanted Island Amusement Park, with a host of rides for children ages 2 to 10 years old. In addition to the website, information on the park is available by calling 602-261-8991.